For the past few weeks that I’ve been on running sabbatical, I’ve been taking long walks on Sunday mornings. The first week I did a paltry 2.15 miles from my house to the Red Box at Kroger down to Publix and back. The next I wandered around in the awful humidity to do 5.65 miles around the nearby subdivisions. Finally, yesterday, I did an unprecedented 9.38 miles (15k). I had just finished reading Born to Run (which was really good, by the way). The book mentioned drinking chia seeds (yes, this is what Chia pets are grown from), so I ordered some on Amazon while I was reading it, and they arrived the next day. You mix the seeds with water and the seeds form a gel around them, which then you can mix with smoothies, yogurt, or just drink in juice or water. They are known as a kind of natural energy drink used by the Aztecs, containing an abundance of omega-3s, protein, and fiber. ABC News has declared them the food of the year. Before my walk on Sunday, I decided to make myself a little chia concoction. I’m still perfecting it, but I’ll post some recipes at some point in the future. That distance came about when I decided to walk from my house down to the greenway, which I plan on running during half marathon training. I knew it was about 3 miles there, so about 6 miles roundtrip. I figured it would be a good idea to make sure that it was a good runnable route, with crosswalks where they were supposed to be and whatnot. The first mile or so you get to walk by (and over) the Hermitage, so it was really pretty. After that, fast food and strip malls take over, and it’s not as scenic. As I walked past a newly built strip mall, they were watering the grass, and I enjoyed the little splashes that hit me. Once I got to the greenway (about 3.2 miles total), my legs felt great, so I wandered 1.5 miles down the path until I decided to turn around and head back. I only decide to turn around because I didn’t think I could actually handle a 9-10 mile walk (and this was a brisk walk, not just a stroll). I’m not going to say that the chia seeds helped (it could have been the lower humidity), but my legs still felt great 5 miles in. They still felt pretty good when I got back home, although I did promptly take an hour long nap. This really got me excited to start half marathon training. I had to stop myself numerous times on my walk from breaking out into a run, but I knew from trying on running shoes a few days earlier (more on that later) that my hip still wasn’t 100% and still needed more rest. 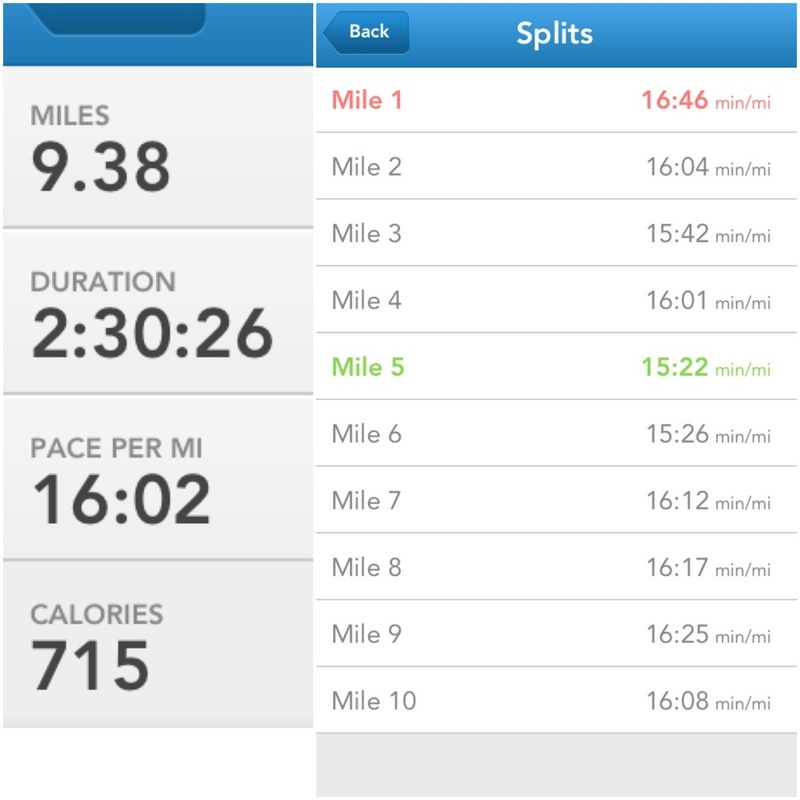 Splits below (I use Runkeeper to track my walks since it separates the stats out from the running stats). The two miles on the greenway are the fastest, probably because it was all shaded, and I didn’t have to stop for traffic or cross streets.